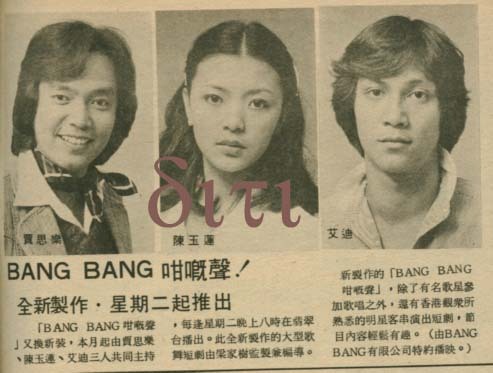 Young Idy Chan as co-host of Bang Bang 咁嘅聲! show with Chow Yun-Fat and Adam Cheng as guests. [Ta Kung Pao – by reporter Yueng Bun from Changsha (captital of Hunan)] Feeling good for the first time returning to hometown Hunan/Regards Andy Lau as idol. Because of holding a post on this week’s “Strictly Come Dancing” as a judge, recently resurfacing “SLL” Idy Chan arrived in Changsha as promised. Being half of Hunan origin, Idy Chan expressed that it’s great to go back to hometown first time. Fading out from the showbiz for 16 years, Idy has become appreciating Andy Lau more, but when asked on the past affair with Chow Yun-Fat, she only politely answered with one word “Thanks” and prefers not to discuss more. Due to her portrayal of SLL, Idy Chan does have a great affect on generation of TV viewers. But there’s no resemblance, she has the Hunan fire blood in herself. Smiling Idy Chan said that her mother is Hunan native, therefore, there’s always a special sentiment towards Hunan, and this time when she got the invitation she agreed immediately. “This is my first time returning to Hunan, it’s very good feeling!” Idy expressed that before passing away, her mother often suggested that must come to Hunan for a visit, this time Idy arrives at Changsha to fulfill her mother’s wish. SLL image has deep roots in people’s hearts, Idy & Andy Lau’s ROCH1983 version is the classic of the classics. Although separated for more then 20 years, when mentioning Andy Lau, Idy is full of approval. She frankly speaks out that although Andy is little younger than her and entering the showbiz a bit later than her. “But everyone can see that Mr. Lau’s reputed career, his today success results from diligent steps.” She said Andy Lau’s not only her partner once, but he’s always her idol. Overwhelmingly praising Andy, but when reporters asked on her past affair with Chow Yun-Fat, she appeared to try to avoid it. It’s possible that at her middle-age, she doesn’t want to talk about old stories. When asked about the former relationship, she’s becoming awkward but quickly answered “Thanks” politely and wanted to change the topic. Idy Chan’s career seemed almost rest to seclusion, now appearing as a “divorcee” in “Thieves With Principles (lit.) 盜亦有道” Once the young, innocent “SLL”, now turns into every opportunity of a housewife, the future of Idy Chan’s resurfacing is not so bright. Early many HK media make that the reason she returns to showbiz now because of financial reason. Regarding this, Idy relates the script in ROCH to explain the reason she returns “Gor Yee, we haven’t seen each other for 16 years”. She said that this year happens to be the 16th year since she faded out the showbiz, just a coincident. “Perhaps this is destiny” She sighs! 2007.09.20 Idy Chan @ SINA Interview: is of Hunan origin "Yeung Gor & I have promised a date"
At noon today [Sep 20] @ Idy Chan at HiFly & SINA honored guest chatroom. H: Hello fellow net friends, this is the HiFly and the SINA Net synchronization live chat room. Now having with me right now is the honored guest that everybody’s has been anticipating, Miss Idy Chan Yuk Lin. Idy, how are you? H: I know that you come today, my heart pumps fast as if it jumps out. I: My Mandarin is not that good, my heart pumps fast as if it jumps out too. H: Today you’re coming to sit on the judging panel? H: How’s it coming to Hunan for this program? I: I feel very amusing, have heard that Hunan is very beautiful. Also, my mother’s Hunan native, so I must come. H: So you’re really of Hunan origin. I: That’s right, I never had a chance to visit. My mother passed away already, but when she was alive she told me must visit Hunan. So I’m here as her wish. H: How do you feel about Hunan now? I: I haven’t get to see anything yet, just got off the plane. H: Are you familiar with Hunan food? I: In Hong Kong, my mother cooked Hunan dishes before, I’m certainly familiar with it. H: Do you watch “Strictly Come Dancing” at home? Have you seen any dancing competition? I: In HK, this program hasn’t been aired yet, but I’ve read magazine reports on it. H: What’s your thought on “Strictly Come Dancing”? I: Very amusing program. Beautiful. Because everyone is beautiful, and dancing makes it more attractive! H: Have you watched other Hunan TV programs? H: Yes, there’s also “Joyful Male Voice“, how do you think about New Talents contest? H: The contest has selected many new talents like Jason Zhang Jie. Jeffrey G (Ji Jie) is also from New Talents Contest. Wait a little more and you will see their dance performance. There’s so many media friends here, they have questions to ask you. Now I give the time to you all [reporters]. R: I would like to ask what is your next function? or your plan? I: You asked here [in Hunan] or in HK? I: Actually no big plan, will make a TV serial with TVB, and after finish it then will see. R: I would like to ask. It has been more than 10 years since you have acted. What made you return to acting? I: Come to think of it, it is very fun. When you asked me that question, I thought of something. When I was filming ROCH, Yeung Gor [YG] and I were separated for 16 years. It’s such a coincidence now, it feels like YG & I have set a date, I’m out now to meet him. H: What a beautiful date. I: I was just calculating, it has really been more than 10 years since I’ve acted. I just thought of a sentence from the script in ROCH. R: Then, when you acted with Andy Lau in ROCH, it became a classic which everyone remembers. Do you still keep in contact with the cast in that series? R: Then, you were Andy’s idol, now as you look back, what are your thoughts & feelings? I: Andy is my idol. R: Over 10 years have passed, can you grade him? Then, he was just a young lad. I: Actually, I’m only a little older than him, our age gap is not big. He entered into showbiz a little later than me. He is very diligent & puts in his heart in his work. Therefore, he deserves what he has earned today! R: I would like to ask now that you’re coming out, people on the internet talked about the past affairs between you and Mr. Chow Yun-Fat, you do mind they at all? I: Thanks, wait a little and I’ll tell you again. R: Can you disclose how life has been for you after all so many years absence from the showbiz? I: I did charity work, so many charity organizations in HK. Several years ago, I also studied pottery. After that I helped mentally disordered patients, I also taught them pottery at hospitals, so the years had passed like that. R: Why did you do these things? I: Actually, when I have more information I will tell you. R: How different between doing charity work and making a movie? R: So many years of doing charity, what is your source of income? 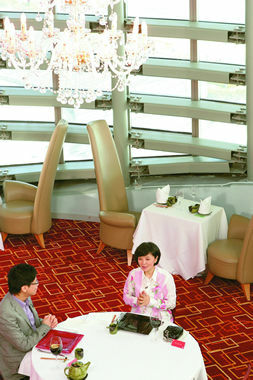 I: Savings with my acting income years before, my family & I have family business, we have business in Shanghai. R: Is this your first time on the judge panel? R: This time as a judge, is there any standards? I: I don’t have any standards, we’ll see when on the show. R: You haven’t thought about it? I: It hasn’t happened yet, I cannot guess. R: How you do you prepare to appear as a judge? Friendly gentle or strictly hard? H: His question to you is are you easily kind or very strict? I: I think we only know when at the scene. Idy Chan graced the cover of Book A of Mingpao Weekly #2022 (August 11, 2007) and the online version’s out today [Aug 24 ’07]. Please revisit news on Aug 12 ’07 @ CYLO. SLL & YG had been separated from each other for 16 years long but in reality, Idy Chan quit acting for 14 years after filming her last TVB drama “Can’t Stop Loving You 愛到盡頭” in 1993 and only showed up in some charity activities occasionally. 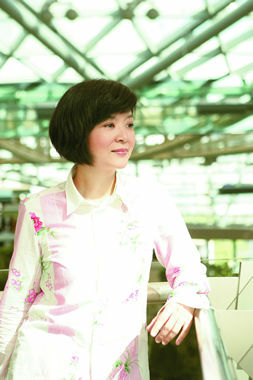 Rumors said that she had won a total HK$47 million lottery in 1995 & 1998 respectively, led her to a rich & carefree life. But there was also a saying that she was living in seclusion because of her enthusiasm in religion all these years. 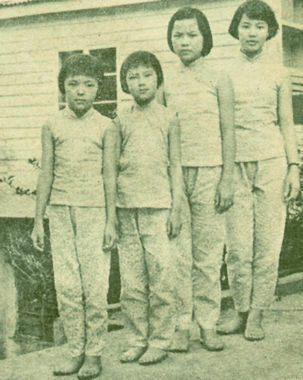 At 17-year old, Idy Chan enrolled in the 6th TVB actors training class in 1977. Her love life had never been a pleasant one. First, she ended the 5 years bitter love relationship with Chow Yun Fat. Then married LA casino executive Peter Chan Siu Moo but their marriage only lasted 8 years. Later the media suspected her in a homosexual love for 11 years. Just in time Idy resumed starts filming again, she was interviewed in “Be My Guest 志雲飯局”. She talked openly about her past romance and also claimed she’s willing to be friend with Fat Chai but it’s just that they didn’t have chance to run into each other after the breakup. Stephen Chan described Idy had isolated herself from the world all these years. But Idy said she was just ‘playing’ & ‘fooling around’. Apart from doing some volunteering works, she didn’t see her family members for 2 years. She said it was all because of the religious learning. Idy didn’t speak any further about the religion since she thought it was too much to tell in a one hour programme and she’s afraid the audience would wrongly take her meaning so she’d rather to talk about it in private. S: what did you learn from your master? I: Kungfu, qigong and mainly is Taoism theory…it’s about physical and mental training. (S: sounds very complicated) No, it’s not. I’d been secluded for 2 years, didn’t see my family and friends. I only stayed together with my master and senior sisters. (S: was it hard to adapt? Did you miss your family?) I got it well prepared since I’d discussed it with my family years ago. They understood me, though they were not accustomed to my sudden absence. S: Now are you getting out of seclusion? I: Haha, even now I’m just ‘work for nothing’. (S: Can you see your family members?) I’ll if my master tells me so. Actually except my father, no other family members are living in HK. S: How do you live without working? I: I have my family to support me and my master treats us well; she even took care of my livelihood. S: I heard you’d won lottery twice. One was in Canada for HK$17 million and another time in HK 11 years ago for HK$30 million. Is it true? I: haha…..I’ll answer you in private. (S: hey, at least you don’t deny). Just tell you in private. Grew up in Tiu Keng Leng, Idy said her father had been a soldier who graduated from Whampao army school and followed Zang Jie Shi. He ran a meal-catering business in TKL which offer food for more than a hundred children. But he was in big debt since he had been borrowing money from the neighbors for a very long time. At that time Idy’s elder sister was working for an entertainment magazine ‘Sisters’, she recommended the 17-year old Idy, who still had not finished her high school, joined the showbiz in order to pay her parent’s debt. S: Did you get the leading roles once you completed the training class? I: Not really. I’d worked as extras for many years like corpses and palace maids but I thought it was funny. It earned me much money than my basic wages because it counted on each show time, the longer I made the more I earned so I could save up the money to pay the debt. I was willing to play as a corpse. S: You landed the leading role in ROCH83’? I: Yes. Back then people were longing to film lengthy drama. But I ‘d never gotten one before shooting ROCH; I’d only worked for one-episode drama. That’s why ROCH is unforgettable to me. S: What do you think you are similar to SLL the most? I: the silliness. Haha, I really think I’m silly. SLL always said nothing so I think she is silly too. I’m just like her. S: Andy Lau said he was happy filming ROCH everyday coz he could see gugu. When you film, will you fall for your partner? I: I’ll love my partner in my role. But I’ve a drawback when I act, I only put a small portion of me into the role and will detach from it very quick. It’s a paradox becoz if you detach too quick, you can’t love your partner in the drama even you really want to love him. (S: that’s why you fit the role of SLL) Right, my SLL was good but my other roles were really bad acting. Actually my acting skill is not good. (S: Had you ever fallen for your male partner when you were too absorbed in the role?) No, I thought I should not when I was dating someone. S: If you were not taken, would you accept Andy Lau back then? I: I don’t think I would since he was younger than me. In our times, girls only like those men who are older than us. In my mind Andy was just like a kid. He’s liked a ball of fire on the set. (S: he wasn’t mature enough?) No, it’s just I wanted someone mature to protect me and not the other way around. S: How do you get to know Mr. Chow? I really can’t remember. I forgot it completely. (S: was he romantic?) I didn’t know. Maybe I was very young at that time, only 17. But he is very nice to his family and friends. S: Some old reports said apart from CYF, there were many rich guys wooing you. Why didn’t you choose any of them? I: It’s not I didn’t choose but becoz I’d already had a boyfriend. I was just dull. (S: single minded) It’s the same thing. I think I’d be more flexible. I didn’t marry to him, even I did. I still can make a choice. S: What’s in CYF that attracted you? I: haha, I think I was dumb…he’s several years ahead of me. But perhaps he was tall so when he stood besides me, I thought he could protect me. I’ve always had a soft spot to this. I want to find someone who can protect me. S: You broke up because he couldn’t protect you anymore? I: No. In fact, there were so many other issues. (S: A third wheel?) I didn’t know about him but it was not the reason. (S: then what’s the main factor?) We were not perfect match to each other. (S: but you two had been dating for several years?) Right. What I meant is….we could not see each other so often since I only acted as corpses, so I’d always be free but he might be busy. Then I thought he couldn’t protect me. S: Had you ever thought him as a good candidate of marriage? I: Definitely yes and I even thought he must be the one. (S: then why separated?) Actually when I first met him, he didn’t get famous. It’s real. He was famed when we started dating. I remembered he was filming when we were dating and didn’t film , yet. Then he became very famous and we didn’t see each other much. (S: You initial a breakup?) Probably was. haha. S: Did he feel sad? I: You should ask him. But it’s strange that we didn’t meet each other after the break-up, not in the streets nor any places. (S: Can you be friend with him now?) Ok, sure ok since I’d already decided long ago we could be friend when we meet. It’s just that I didn’t know how to deal with it back then; I was not mature enough. Thinking back…it’s really weird that we’d never run into each other in any places, though I didn’t try to avoid anything. (S: is it something to do with fate?) Fate? Haha. I do believe one could make it happen and it’s just that you want it or not. Maybe neither of us has the heart. S: some old reports said that he once tried to suicide, at your home. Is it true? I: Hmm….I know…I was there….but I will answer you in private. S: It happened while your break-up. Did you feel uncomfortable? I: It’s not because of him. I think each person is an individual so if someone wants to hurt themselves or end their life. It’s their problem. In end of 1982, 4 months after the suicide, Chow Yun Fat married Candice Yu on-on in light-speed while Idy also agreed to marry Peter Chan, whom they met in Sept 1982 and they married in 1984. The matchmaker was Lydia Shum. I: Lydia took care of me so much. When she knew I’d broken up with Mr. Chow, she introduced me to some other guys as she thought I was a good girl and seldom had rumors. S: So was it love at first sight? I: Yes, that’s me. I’d settle down once I think he is the one. Actually, I was working in TVB for quite some time but I really didn’t think I fit in. I didn’t know how to manage human relationship. Back then I didn’t talk much as now. I came from country area so I feared a lot as being working in showbiz. I didn’t know what to say in proper so I’d always zipped my mouth. (S: black face?) Yes, I really kept a black face. Many reporters told me today that they really wanted to slap me in the old time. The truth was they always asked me about Chow Yun Fat but how could I reply? I didn’t know what to say but just made a black face. S: Why can’t you answer? I: No, I couldn’t. He’s promoting so how can I let out our relationship publicly? (S: he demanded it?) It’s the company. They told us to keep it low key and I had to agree in order to protect him. S: Let’s talk about Mr. Peter Chan. You settled down in USA right after your wedding but then you quickly returned to HK. Was it hard to tie your marriage? I: It was one of the problems. I really wanted to quit from the showbiz back then. But I knew I couldn’t when I reached there as I’d have to come back filming. My husband was working in a casino so he was related to the showbiz in some sort that’s why I came back working. (S: you two had agreement?) Actually we didn’t talk about this. It’s just natural thing that whenever there has job, I’d return. I’d been stayed in Taiwan filming for a very long time. (S: spending less time together?) Yes, it was. S: It led to the divorce? I: I really don’t know. Something really needed my reflection and so I could learn a lesson. But something doesn’t need nor worth for reflection. S: Won’t you marry again? I: Right. I’ve never thought I would remarry….actually it is so wrong with this answer. I didn’t do any reflection is not because I won’t marry again. Instead I think it is no big deal so no reflection needed. S: Your ex-hubby once commented before your divorce that if one day your marriage ended, the third wheel must be a woman. (I: Oh?) Why he said that? I: I don’t know what made him think that. (S: Actually is there any woman wooing you? )…..Of course yes! Both men and women; it’s never stopped. But I’m a loyal person and I only date one person at one time. (S: will you accept women then?) hmm…I will tell you secretly, haha. In Feb. 1999, Idy was reported to have secretly married Louis Castro. But when she interviewed by Louis C. in a radio programme, she disclosed she was in a 5-year relationship and this led those paparazzi to dog her in order to find out who was the guy. But finally they spotted out the “he” was famous female director – Maisy Choi. It’s said that their relationship lasted for 11 years and they broke up 2 years ago. S: If you didn’t reveal it in the radio interview in the first place then no paparazzi would chase after you. Did you regret it? I: I wanted to help Louis out at that time because rumors said that we were together. He’s my good friend and we talk about everything. Until now we are still very good friend. (S: But it brought you trouble instead.) Hmm, let me tell you in private, haha. S: After ending up in a few relationships, have you lost confidence in men? I: It has nothing to do with men. In fact it’s the nature of human being. It is the problem of human relationship. General speaking, don’t try to make anything if these things (relationship) don’t happen and then nothing will come to bother you. S: Will you act again? I: I will but I have some rule. I don’t mind if my role is a good person or a villain but it can’t be evil. I hope it could inspire the audience and not just a good laugh. (S: will you resist love scenes?) No, I don’t. But no kiss & no body-touch. (S: haha, no intimacy.) I’m okay with holding hands but I really can’t accept kisses. I think the farther to go in TV is just kiss scenes.